Helps prevent blemishes and breakouts. reduces redness and irritation. 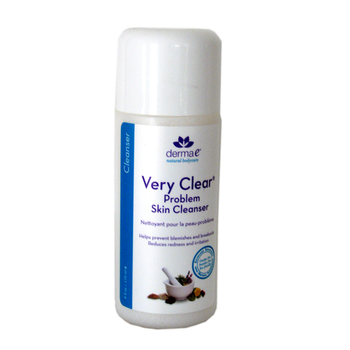 Derma e Very Clear Problem Skin Cleanser will gently remove built off of oil and debris from the skein, helps unclog pulse and prevent future breakouts. This effective cleanser utilizes a special blend of natural ingredients (Tea tree, willow bark, rosewood, lavender and chamomile) that has been shown to be very effective on blemish prone skin. Excellent on oily or dry skin, and will not leave a residue or irritate the skin. Use twice daily. Moisten your face, apply a small amount, about the size of a penny, to the Palm of your hand or a washcloth, and then massage over your face or blemished skin. Rinse with warm water, pat dry. water (aqua), melaleuca alternifolia (tea tree) leaf oil, glycerin, glyceric stearate and Peg-100 stearate, stearic acid, capryilic triglyceride, salix alba willow bark extract, cethyl alcohol, cocamidoproply betaine, lavandula angustifolia lavender oil, aniba rosaeodora rosewood wood oil, organic chamomilla recutita matricaria flower extract, polysorbate, phenoxyethanol, ethylhexyglycerin.